Nissan Bluebird 160B 180B 610 10/1975-6/1976. Sunny 1.2 120Y B210 1976-1978. Sunny 1.2 1.4 120Y 140Y B310 1979-1982. Sunny 1.5 B310 1981-1982. Sunny Van B210 B310 1975-1982. 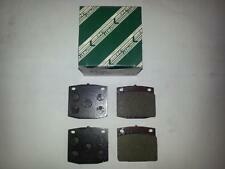 I have for sale a new set of brake pads to fit.